The Embassy Suites San Diego - La Jolla hotel is an all-suite, full service hotel located in an upscale area known as University Towne Centre in San Diego, California. Conveniently situated between Interstate 5 and Highway 805, it's an easy drive to San Diego's major tourist attractions such as: The San Diego Zoo, SeaWorld San Diego, Balboa Park, The Gaslamp District, Home of the San Diego Chargers, Torrey Pines Golf Course.The gorgeous California beaches of La Jolla, Del Mar, Mission Bay, and Coronado are just minutes away from the Embassy Suites San Diego - La Jolla hotel.This San Diego, CA hotel features 340 spacious two-room suites that have just been 100% refurbished and they're fabulous With separate bedroom and living room, and standard amenities including a wet bar, coffee maker, microwave and refrigerator, you'll enjoy all the comforts of home. New upgrades include Zen-inspired bedding, a 32'' LCD television, granite topped accent tables, MP3 player/clock radio, and functional workspace with ergonomic desk chair. Wireless and hardwired high-speed Internet access is also available throughout the hotel. 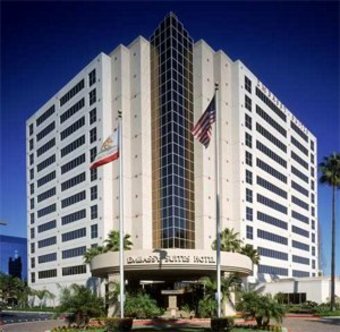 This San Diego hotel offers a wide array of vacation packages for all our Embassy Suites guests. Embassy Suites San Diego - La Jolla hotel is just minutes from the beautiful seaside village of La Jolla. There you'll discover boutique lined streets, art galleries, and fine dining perched atop jagged cliffs. And La Jolla's beaches make for the most romantic sunset viewing Check out our romance package.Start your day at this San Diego hotel with a complimentary full cooked-to-order breakfast featuring a ''create your own omelet'' bar. Served in our sunny, 12-story tropical atrium, it's an inviting atmosphere with lush plants, a koi pond and waterfalls. Join us every evening from 5:30pm to 7:30pm at our complimentary Manager's Reception...relax, enjoy a cocktail...and contemplate ''what's for dinner''. There's our new ''Indulge Restaurant and Lounge'' offering American cuisine...or choose from a dozen other restaurants within walking distance. Whether you're in the mood for a casual meal or the best fine dining San Diego has to offer, you'll find it just steps from the Embassy Suites.The Embassy Suites San Diego - La Jolla concierge can suggest personalized itineraries to help you make the most of your visit to the Beautiful City of San Diego - known for its abundant sunshine and healthy attitude. Experience San Diego at this amazing California Hotel like a ''native'' We'll help you plan a glorious day that may include: Sea kayaking, Docent led hikes among rare Torrey Pines, Biking along the beach, Hiking canyons, Surfing, Hang gliding.If shopping is your idea of enjoying the fresh air, Westfield Shopping Town UTC, a lovely outdoor mall with over 160 shopping destinations, is directly across the street.The Embassy Suites San Diego - La Jolla is not only ideal for family vacations but can also transform your California business trip into pleasure Our 3,200 square feet of meeting space is comprised of five comfortable, functional meeting rooms that ensure productive meetings and memorable banquets. Our friendly catering staff will walk you through every step to create the perfect event.